The rooms and equipment used for surgical procedures. Room equipped for the treatment and specialized medical supervision of patients whose condition is unstable. Room in which a patient awakens after receiving a general anesthetic as part of a surgical procedure. Sterilized room used to store clean disinfected surgical materials. Airtight metal container that sterilizes materials using steam under high pressure. Basin-shaped sanitary device used to clean equipment. Room in which microorganisms on surgical instruments are destroyed. 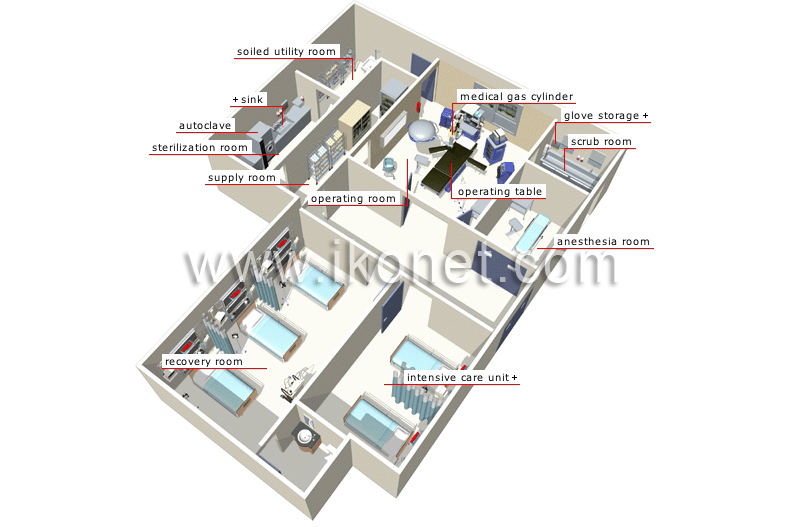 Room in which surgical materials are placed after use. Articulated table on which the patient undergoing surgery lies. Device that supplies an anesthetic to the patient during a surgical procedure. Sterilized room used to perform surgical procedures. Room in which surgeons wash their hands before a surgical procedure. Room in which patients receive an anesthetic to dull sensitivity to pain before an operation; an anesthetic can be general or local.